A pressure washer in Houston, Tx is a high pressure sprayer that is used for cleaning different types of surfaces. A pressure washer consist of a pump, motor, a high pressure hose, and a wand. For increasing the pressure, there are two different ways of doing this. First, you can adjust the unloader up or down for different levels of pressures. You adjust this for different cleaning applications. The second way to adjust the pressure is by using different size spray tips. The smaller the opening in the spray tip, the more pressure your pressure washer will put out. The opposite is the larger the spray tip, the less pressure the machine will put out. Two types of pressure washers to choose from are either electric or gasoline. Electric pressure washers in Houston Tx are used for stationary use when you have electricity available. 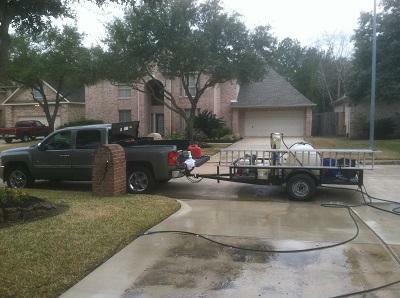 Gasoline pressure washers in Houston Tx are used when you need to be more mobile. Three important things to understand about a pressure washer is PSI. GPM, and CU. The first thing is PSI which stands for pounds per square inch. Water pressure is measured in PSI which makes it necessary to break down the chemical bond between the surface and the stain to be cleaned. The stronger the chemical bond is on the surface the more pressure that is required. The second thing to understand is GPM which stands for gallons per minute. GPM means the volume of water that runs through the pump. The greater the GPM, the faster the surface area can be cleaned. The third thing to understand is CU which stands for cleaning units. To figure CU you simply calculate by multiplying the gpm times the psi. gpm x psi =cu. If you are homeowner that likes doing it yourself, here were a couple of useful tips on choosing the right pressure washer in Houston, Tx. You can use these tips for renting or buying a pressure washer. Or, you can call the professionals at SMC Cleaning Services at 281 899-0402 for your next pressure washing project in Houston, Tx.